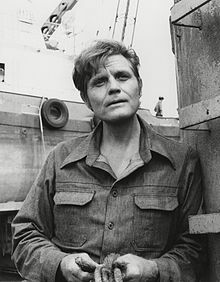 John Joseph Patrick Ryan (December 30, 1920 – January 21, 1998), best known by his stage name, Jack Lord, was an American actor, director and producer. He was known for his starring role as Steve McGarrett in the CBS television program Hawaii Five-O, which ran from 1968 to 1980. Lord suffered from Alzheimer's disease for at least seven years before his death. He died of congestive heart failure at his home in Honolulu, on January 21, 1998, at age 77. ↑ Fernandez, Collin (13 December 2007). "My battle with Alzheimer's". Daily Mail. ↑ Donnelley, Paul (2003). Fade to Black: A Book of Movie Obituaries. Omnibus Press. pp. 434, 435. ISBN 978-0711995123. ↑ "Hawaii Five-O - The 12th and Final Season". DVD Talk. This page was last changed on 15 February 2019, at 16:39.